Matthew B. Harrison, DDS, is a native of Camden, Arkansas, and has lived in Rogers since 2005. He graduated with high honors from both Ouachita Baptist University and The University of Tennessee College of Dentistry and has been practicing dentistry since 2002. Dr. Harrison also continues his studies with the Kois Center for Dental Excellence in Seattle on an annual basis. Prior to moving to Rogers, Dr. Harrison served for three years in the U.S. Army Dental Corps where he completed an Advanced General Dentistry residency at Fort Meade, Maryland. 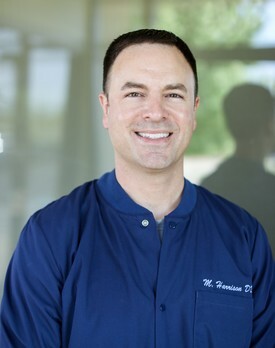 During his year-long residency, Dr. Harrison received specialized training in endodontics (root canals), orthodontics, periodontics (gum treatment), pedodontics and oral surgery, including implant placement. He is also a veteran of Operation Iraqi Freedom, where he served as the Brigade Dental Surgeon for the 1st Brigade Combat Team, 1st Infantry Division. Dr. Harrison is a member of the American Dental Association and the Arkansas State Dental Association. He and his wife, Laura, have one child. The Harrison family enjoys golf, reading, travel, Cardinals baseball and the Razorbacks. Dr. Harrison is currently accepting new patients.